Having come from the nonprofit side of the fence, one thing that was of utmost importance to my NPO was the need for clarity in communications with our event attendees (some donors, others prospects), about where we were financially; where we could be with more resources; and how our guests fit into that opportunity equation. Our communications were clear that those passionate about our mission and programs would have a chance to invest in our results. Our mission and success stories were driven home every chance we got throughout the year. During our events we told stories of our program recipients as well as of our valued staff and volunteers who delivered those services. And yes, we did it with the precision of a surgeon, implementing to-the-minute timelines. When I transitioned full time from my nonprofit role into leading the Benefit Auction Institute, while continuing to manage my family’s benefit auction business, I wanted to infuse that clarity into our classes and our consultations. It has been a process. Not long ago I was talking with another Benefit Auctioneer about an event he was going to have a hand in promoting. He made the case that the description of the event should sound like fun, and not include the word “fundraising” anywhere in the invitation, which he felt could be a turn-off to some attendees. He was entitled to his opinion, of course, but I couldn’t disagree more strongly—and here’s why. If your event’s priority is fundraising then say that loud and proud, my friends; say it often and well before your event. You are asking people to make a gift—sometimes a really significant gift—and that requires discussions among spouses/partners prior to your event. If you’re already promoting your big ticket live auction items before your gala, kudos to you. Now it’s time to give your Fund-a-Need communications the same courtesy. 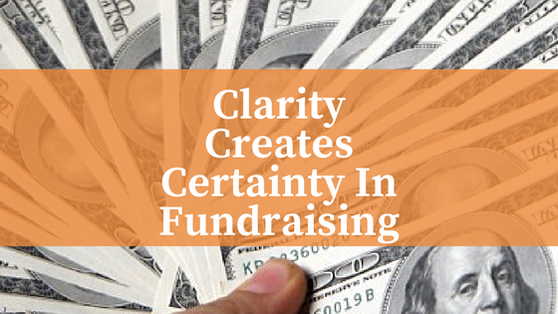 Your fundraising clarity before your event will give your important donors the information to make key decisions before they’ve even walked in your door.